Overlooking the James River, Virginia. 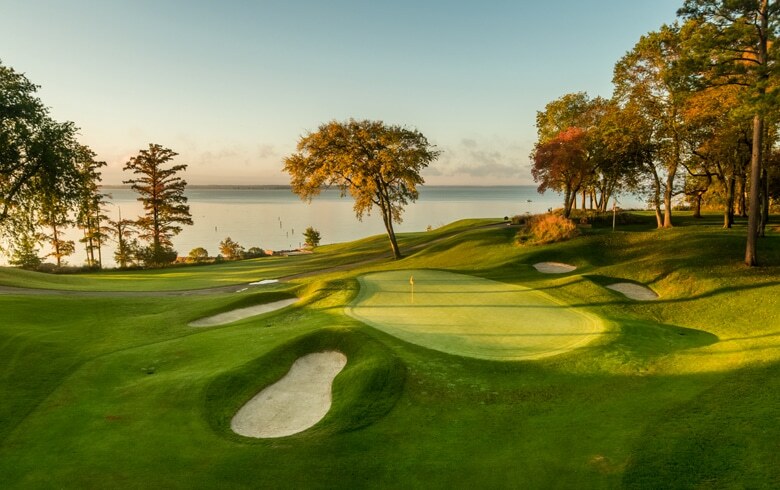 Come play with the stars of the LPGA, walk where Pocahontas once walked, and where America was born! But well before aggression – or the early settlers who arrived to this very shoreline to seek a new home –Native Americans lived here and enjoyed the oysters that are still plentiful and being served up at the 19th hole here at Kingsmill Resort, the only AAA Four Diamond condominium resort in historic Williamsburg, Va. Today, when golfers walk between the tee box and the green at the River Course’s 17th hole, they are stepping on the same land where the Jamestown settlers stepped off their boat in 1607. Those settlers would later sail upriver and start what is now the United States of America at Jamestown. The old pilings in the river are the location of their original port and start of the road from the James River to Williamsburg, the amazing Colonial town that’s still thriving 400 years later. To the left of the hole are the foundations of what was basically a pub, early warehouse, hotel and some say a brothel all dating way back before 1776. Aerial of the 16th and 17th holes on the River Course. And while you may not eagle this hole (which would be a hole in one, too) it’s quite common to see the American Bald Eagle flying overhead. They nest on the grounds of Kingsmill Resort. Perfectly fitting for the most 177 historic holes of golf in America. 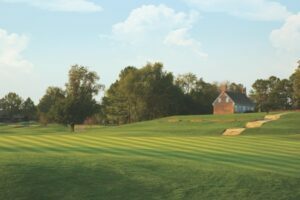 Kingsmill Resort, also home to the LPGA Pure Silk Championship, is teeing up two golf experiences you don’t want to miss during this year’s tournament, May 20-26, 2019. It’s two opportunities on Monday and Wednesday, where players of all handicaps are welcomed and can make their own history alongside LPGA pros, plus gain insider tips from the pros and how they plan to conquer the course. It’s a scramble format, so there’s no pressure, just fun! The excitement starts with a player’s reception, so participants will get a chance to meet all the pros in attendance, and after the Pro-Am, they can stick around to enjoy clubhouse tickets and catch all the action during the Pure Silk Championship. 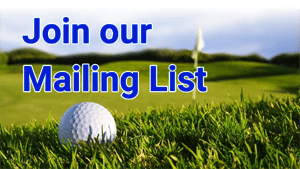 For more information or to register, contact Kristen Ward, Kristen.Ward@kingsmill.com, 757-253-3990. While at Kingsmill, make sure to check out the new Estate at Kingsmill on a magnificent bluff overlooking the James River. This 7,000-square-foot private estate with panoramic views of the James River is the newest luxury accommodation on this fabled land called Williamsburg. Located within the gated, manicured grounds of Kingsmill Resort, the structure – formerly known as Pettus House – was originally built as the private mansion for the Busch family, of Budweiser Beer and Busch Gardens fame. The four-bedroom residence provides full access to Kingsmill Resort’s world-class amenities including golf, tennis, spa treatments, yoga and Pilates classes, two luxury SUVs, customized golf carts, private jet skis, personal shoppers, laundry service, and personalized menus and music selections. Guests will also have the rare opportunity to experience both the sunrise and sunset from the same location, as they gaze over the majestic river and across the historic landscape first seen by British settlers in 1607, where Pocahontas once walked and where America was born. 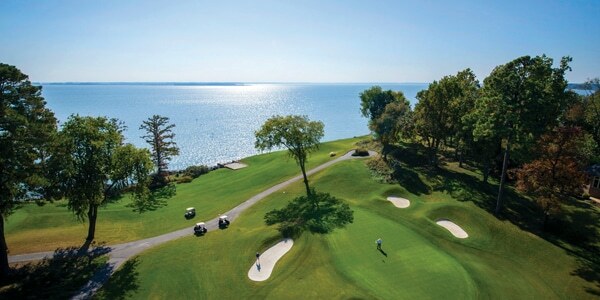 For more information, visit www.kingsmill.com or call (800) 832-5665.